Bear claws are a delicious and satisfying pastry. Filled with a flavorful almond-cinnamon filling, these tasty pastries are perfect for breakfast, morning snack, or brunch. Traditionally filled with almond paste and cinnamon, bear claws are made with yeast-raised dough similar to croissants. You form and cut them using a pastry cutter so they resemble bear claws. Dissolve the yeast in the warm water in a large bowl. Allow it to sit until bubbly, about five minutes. Stir in the cream, salt, eggs, and sugar. Place flour in another bowl. Using a pastry blender or two knives, cut the butter into the flour until it forms a mixture about the size of small peas. Alternatively, you can pulse the butter and flour in the food processor for ten one-second pulses. Add the flour mixture to the yeast mixture and fold until just combined. Cover and refrigerate for at least two hours or as many as four. Flour a work surface. 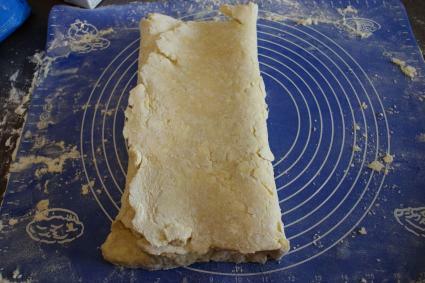 Turn the chilled dough out onto the surface and use a rolling pin to shape it into a 16 x 20 inch rectangle. The dough will have large pieces of butter visible in it and will be shaggy. Fold the dough into thirds to make three layers. Turn the dough one quarter turn. Roll it into a 16 x 20 inch rectangle, dusting with flour as needed. Fold the dough into thirds to make three layers. Wrap in plastic and refrigerate for 30 minutes. Turn the dough 1/4 turn and roll it again. Prepare the filling by combining the egg white, almond paste, powdered sugar and cinnamon in a medium-sized bowl. Beat with a beater to combine well. Remove the chilled pastry from the refrigerator. Roll it into a 16 x 20 inch rectangle. 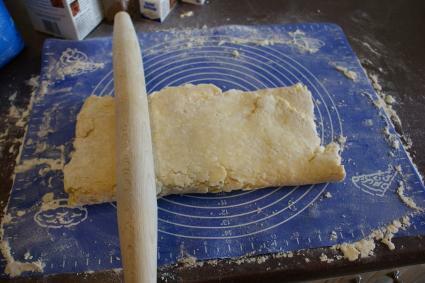 The dough will be much smoother, although you will still notice some small pieces of butter, which will give the finished pastry its flakiness. 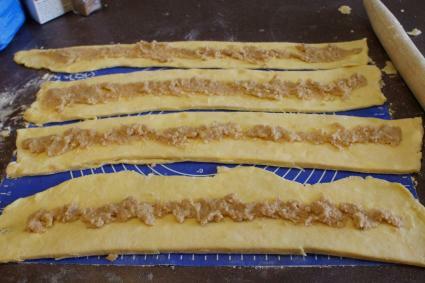 Cut the dough lengthwise into four strips (4 x 20 inches each). Spread 1/4 of the filling along the middle of each strip. Cut into four pieces lengthwise and spread with filling. Fold each strip along its length (so the strip will still remain 20 inches long). 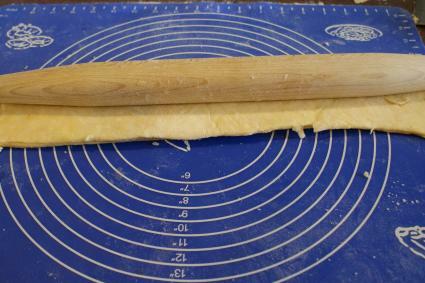 Run the rolling pin over each strip to flatten and seal. Fold each piece lengthwise and roll to flatten. Using a bench scraper or pastry cutter, cut each piece into four equal-sized pieces. Cut four slits along the open seam to just above the center point of each piece to form the toes of the bear claw. Lay each piece on the parchment lined pans, curving slightly to separate the toes and shape the foot. Cover and allow to rise in a warm spot for 20 minutes, until puffed. While the bear claws rise, preheat the oven to 400 degrees. After the pastry has risen, brush the top of each bear claw with the beaten egg. 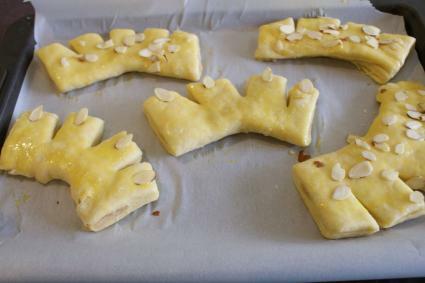 Then, sprinkle sliced almonds on top of the bear claws. Cut the toes along the seam side, brush with egg, and add almonds. Bake in a preheated oven for 10 to 12 minutes, until puffed and golden brown. Cool slightly on wire racks. 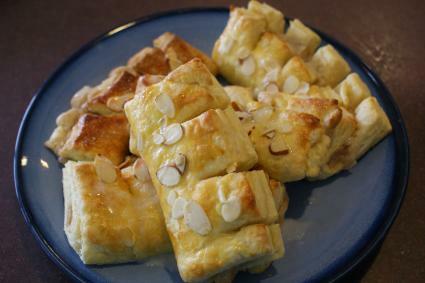 While bear claws cool, combine powdered sugar, milk, and almond extract in a medium-sized bowl until well mixed. Drizzle the glaze over the warm pastry. Serve warm. You can change the flavors of the filling to add interest to the bear claws. Enjoy in place of toast with a plate of scrambled eggs, an omelet, or a frittata. Serve with sliced fresh fruit on the side. Enjoy with a cup of hot chocolate. Serve as part of a brunch buffet that includes eggs, sausage or bacon, fruits, potatoes, and other pastries. While bear claws take time and are slightly labor-intensive, the result is delicious. The fresh flaky pastry and sweet almond cinnamon filling makes these tasty pastries well worth the effort.